EclipseView™ 10x50 Binoculars, Kosmos Scientific de México, S.A. de C.V. The EclipseView 10x50 binoculars are the perfect staple for the outdoorsmen. Portable and durable, these binoculars are sure to keep up with your adventurous lifestyle. Even better, now you can view the Sun with the removable white light filters. 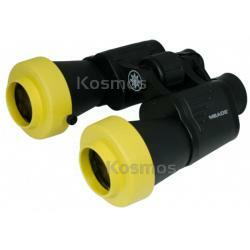 These High-Quality multi-use binoculars have coated optics and BK7 prisms and a rubber armored body for a sure grip. These tripod mountable, solar safe Binoculars are perfect for viewing the upcoming Total Solar Eclipse!